... and why, you, probably, should include them, to your daily reading list !!! Most of the times, as professionals and intelligent persons, we have to read a lot and study various materials just for doing some tasks and performing some activities. Other times, we study, just for fun, or for staying on top of the things! And this is not all! All of the time we need new skills and requirements to cope with the crafts of our trade. And that means information. A lot of them and, if possible, just-in-time. And good resources, of course. You have to select only the best of resources for your information because time is never enough. Isn’t it? I love reading! A read daily, as a principle, discipline and as a necessity! I read books, articles, training material, posts, social networks, comments, news, forums, tweets, etc. For the management of all that resources, I try to find creative ways, methods (as I have explained in detail, in my post with the title: Organize Chrome bookmarks for maximum efficiency) and tools (news and RSS readers and aggregators, as Feedly [Web, Android, iPad & iPhone], Digg Reader [Web], FeedDemon [Windows], SharpReader [Windows], NetNewsWire [Mac], Vienna [Mac], Reeder [Mac, iPad & iPhone], Press [Android], to name only a few!) to cope with the resulted information overload. Reading and writing are important for everyone today! Blogs are an excellent source of information. Currently, as my foremost RSS reader, I use the Feedly, due to its easiness, portability, shortcuts support and portability (and because it has provided good results in my selection process!!!) Besides the RSS feeds of the blogs I’m interested in, I usually keep updated a list of categorized blogs, sites, and resources, I follow frequently (with much interest, indeed!!!) in a folder, in the bookmarks bar of the web browser (I use Google Chrome, at the moment! ), for reference purposes. Why are not leadership & business always easy? Because you need to work a lot on aligning your values to your business! 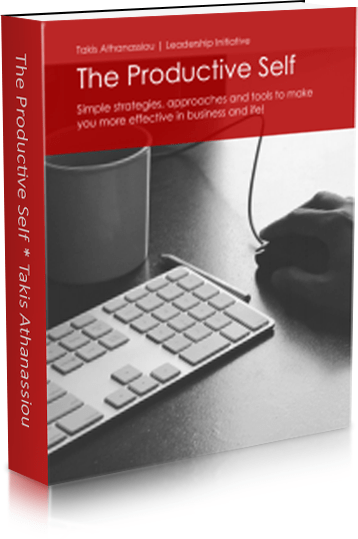 Or, you can get my free e-Book and find new ways and approaches to make your life easier! Get it today! The 21 blogs included in the list, are the best blog sites, I consider as fundamental for every entrepreneur, freelancer or business owner. All are free blog sites can help anyone developed in any area and business niche he/she selects to operate in. To the selection of these top blogs considered the fact that they are very popular sites and constitute the center for the development and growth of even larger communities. In that A-list of resources (which is updated frequently, following my current interests and tasks), I only include the resources I often return for valuable information, and value-added content, both for my business and life. I update the list often, according to the readability, usability and usefulness criteria, of the content they offer (and so I remove or add a resource). According to this approach, I select and maintain my A-List of Bloggers (i.e. resources I definitely would read, either now or later) as a permanent resource of inspiration, information, data, hacks, and tips that would ease my life. 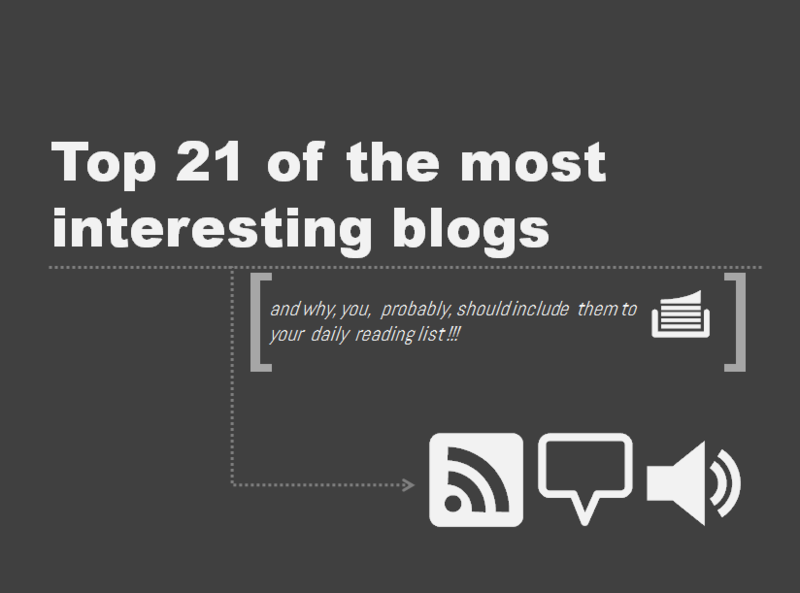 21 Interesting Blogs Worth Reading, Daily! is the bestselling marketing book of the decade (from his about page in Google+). Lead From Within | Leadership and Personal Development| | Lolly Daskal. One of the best thought leadership blogs, I have ever read. Lolly is excellent and thorough evangelists of the leadership, its effects and its intricacies in everyday business, social and personal life. A must read and follow!
. His radio program, The Dave Ramsey Show, is heard on more than 450 radio stations throughout the U.S. and transmits Ramsey’s inimitable financial advice to more than 4 million listeners each week. Dave also hosts his TV show, The Dave Ramsey show prime time on the Fox Business Network“. Skip Prichard | Leadership Insights.One of the best blogs about leadership and business insights you can find around. Skip manage with ease to jungle difficult business concepts with everyday requirements in a business or personal level. ” and “a sought-after professional keynote speaker“. Chris is a well-versed author on the topics he handles and provides an excellent resource of information and insights about the new business and social media. Time Management Ninja. Time Management Ninja is the blog of author Craig Jarrow, aiming at providing valuable information on how you can win “the battle against wasted time, disorganization, clutter, and all other things evil“. 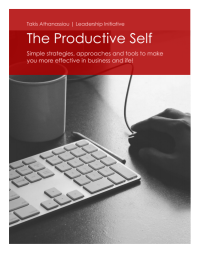 It is one excellent site for time management tools and tricks while covers a lot of subjects about productivity, software, a new technology, skills, and habits. The blog is a valuable resource of hacks that can enhance your life and maximize your time return of investment. Sebastian Marsal. Sebastian is a Strategist, Entrepreneur, Consultant, and Writer [he is the author of the book: Ikigai, an excellent book for personal development], providing valuable insights for Strategy, Philosophy, Self-Discipline, Science, and Victory. He believes that there’s “a class of people who abandon the safety of comforts of following the crowd and look to pioneer the world forward through invention, innovation, and creativity. Marshall’s goal is to help you increase your resourcefulness, resources, and have more impact with the resources you’ve got.” An excellent site and resource of information for business, innovation, and resourcefulness. A must read! , an excellent guide for entrepreneurs in the new age. The Art of Less Doing – Ari Meisel. This is the blog of Ari Meisel on Productivity and Health. The blog started in early 2011 as a blog of productivity hacks. It quickly developed a framework for optimizing, automating, and outsourcing everything in people’s personal and professional lives. The blog covers everything from email management to fitness and helps make everything in life easier. Andrew Chen. Andrew is a blogger and entrepreneur focused on mobile/web consumer products, in particular, user growth. His blog covers a lot of interesting subjects about business startups, entrepreneurship, and marketing of various products. Actionable Marketing Expert | Heidi Cohen. Heidi writes an excellent blog focusing on “marketing related insights grounded in digital and direct marketing. Served with a creative twist, Heidi includes practical tips based on her extensive experience that readers can apply to their marketing. Heidi Cohen simplifies the complex concepts behind today’s evolving digital marketing challenges into an easy-to-understand format that facilitates readers’ grasp of new topics. Heidi’s articles provide valuable insights and tactics that readers can readily apply to their current marketing plans to better engage prospects, customers, and the public“. An overall excellent source of information for marketing and social media. jeffbullas.com. Jeff Bullas is “a blogger, author, strategist, and speaker and work with companies and executives to optimize their online personal and company presence and brand with digital and social media marketing.This blog is about all things to do with Social Media and Online Marketing, including Twitter, Blogging, Facebook, YouTube, LinkedIn, Search Engine Optimisation (SEO) and content marketing“. His “blog’s focus is to assist business in “getting found online” in a digital world and making your company visible and successful on a crowded web”.
. A very important source of information for modern business and marketing. John Saddington. John is one of my favorite bloggers and entrepreneurs in the area, basically due to its fresh ideas and its detailed description about the subjects he covers. His blog covers a variety of subjects related to writing, blogging, business development, online business and startups, WordPress, WP plug-ins and new technologies, entrepreneurship, etc, to mention only a few. John is a businessman and entrepreneur, involved in various companies, with roles as founder, coach, mentor, developer, team leader, trainer, speaker, etc, presenting his views and experiences in a very clear, thorough and detailed way. As a total, I find his ideas and approaches very functional, refreshing and of great value for anyone in the business sector.
. He provides excellent (and sometimes alternative) views for various subjects, especially for business, skills development, and lifestyle. “. He is one of the most influential writers in the area of personal development, simplicity and habits management. We Grow Media – Dan Blank. One excellent resource for writers, authors, publishers, platform and social media experts. Dan Blank offers unique propositions and suggestions for the management and use of new media. and 31 Days to Build a Better Blog, among others.
. The blog is an excellent source of information about new business and startups, new business development, community development, travel and cultures and the new approaches in business and life. Content Marketing Tools and Training | Copyblogger. Copyblogger is the offspring of Brian Clark, “a serial entrepreneur based in Boulder, Colorado. He’s the founder and CEO of Copyblogger Media and Editor-in-Chief of Entreproducer “. Brian “built three successful service businesses using online marketing techniques before moving to a completely online business model. The result of that move — Copyblogger Media — is an innovative company that provides the advice and solutions that empower people to successfully grow their businesses through social media and online marketing.” The site is an excellent resource of information for media and online marketing, as well as for the new business models, that can be built around the content marketing and the blogging. The list, of course, is not complete. I just cover the resources and blogs that have the longest presence in my A-List catalog. And as I have said, I update it often. New names, blogs, news, and resources, enter, stay for a period and either stored for a long time maintenance and reference (as in an archive folder) or are deleted for making room for new approaches ideas, tools, etc. Do you have an A-List for resources you return frequently? Do you find useful this approach? Can use it for organizing your daily reading lists? Please comment on the blogs you are interested in, here.